How can I change my account's billing address or credit card on file? How to update addresses or credit cards on my account. You can make changes to your account by logging in to DeseretBook.com and clicking on My Account in the top right corner of the screen. You will automatically be placed on the Edit Account section, and will see a screen that has the details of your account. To change your address, click on My Addresses on the left hand side of the screen under the Edit Account section. From here, you can click on the buttons on the right side of the screen to add new, edit, or remove addresses from your account. To change your credit card information, click on the Cards on File section on the left side of the screen under Addresses. Here you will be able to remove existing cards on file or add new ones. Note: Cards on File are credit cards that can only be used for store purchases and NOT for subscription renewal. 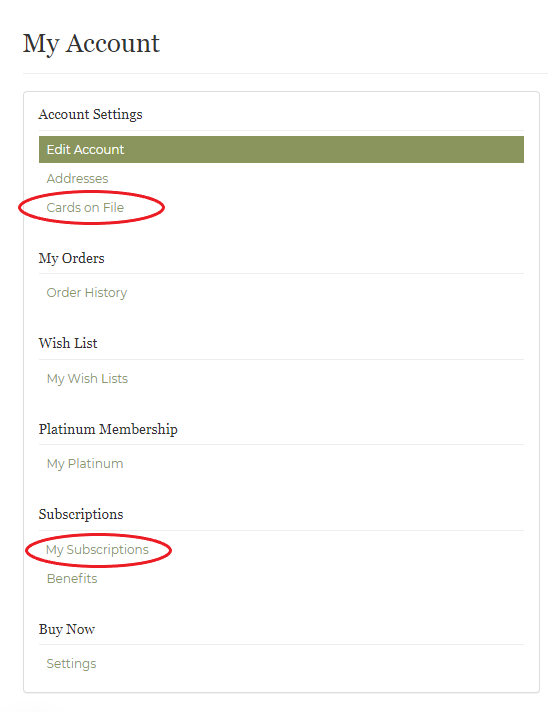 In order to change your credit card information on your Bookshelf Plus or Platinum Rewards subscription, click on the My Subscriptions section on the left side of the screen under Subscriptions. You will be able to see the details of the services you are subscribed to. Click on Edit Subscription. In the middle of this screen, you will see a panel titled Payment Information. Click on Update to manage payment for your subscription. To save your changes, click on Update Billing Information.